Analysis: Would you hire these people? The easiest way to judge public officials is the same way you judge the people where you work: Are they doing a good job? The first rule of politics? Do the work. It’s easier for politicians to argue about political differences and philosophy and such when they’re not busy defending boneheaded mistakes and failures to do the job they’ve been elected to do. Here’s one — of the “he said what?” variety. There was U.S. Energy Secretary Rick Perry, the state’s former governor, grabbing headlines by seemingly connecting fossil fuels and sexual assault prevention. Oof. Perry didn’t get the kinds of headlines he probably wanted, and he ended up looking inarticulate instead of thoughtful. It’s not always an official’s mouth causing trouble, though talking to the public is part of the job and moments like Perry’s are among the hazards of talking. Sometimes, it’s an action instead of a word. Or just a homework failure — an error that can be attributed to not doing enough due diligence. That’s how the state government finds itself in the awkward position of having granted $9.75 million in economic development incentives to McKesson Corp. last year to bring 1,000 jobs to Irving — and then turning around and joining a multi-state investigation into the role of McKesson and other pharmaceutical firms accused of feeding the opioid crisis. The grant from Gov. 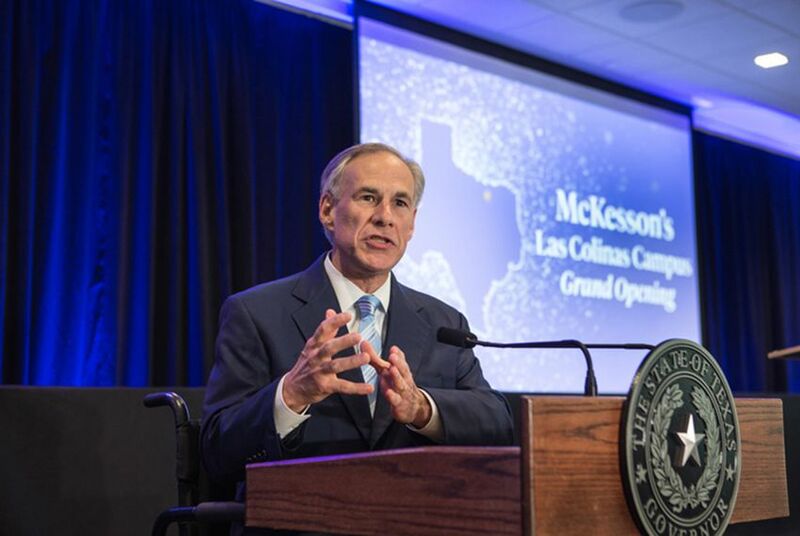 Greg Abbott’s Enterprise Fund is both the largest he’s ever given and the biggest single state or local grant to McKesson since 2000. That’s embarrassing, at best. At worst, it puts taxpayer money on both sides of potential litigation over the opioid crisis. Abbott hasn’t publicly commented on the issue; a spokeswoman for McKesson said the company recognizes the opioid epidemic as a national public health crisis and is having “lots of conversations” with the state attorney general. If that needs any punctuation, try this: The opioid crisis here and elsewhere was well underway before 2016, when that grant was made. Local officials can boot it just as badly. Look at the Travis County District Attorney’s office, wiping egg off its face for a botched investigation and felony indictments — since dropped — of state Rep. Dawnna Dukes, D-Austin. Those prosecutors didn’t screw this up alone: They had help from the State Auditor’s Office and the Texas Department of Public Safety, which produced flawed evidence that Dukes had falsified government forms for expense reimbursements to which she wasn’t entitled. But she was entitled to those reimbursements, as it turned out when the prosecutors retraced their steps and asked the questions they and their investigators should’ve asked in the first place. They ended up looking like a gang of clowns who couldn’t put Lego blocks together, fueling persistent legislative criticisms that their investigations of public officials sully politicians who committed no crimes. It’s the kind of mess someone might ask District Attorney Margaret Moore about next time she’s up for election. Abbott’s grant to McKesson is another arrow in the quiver of critics from the right and from the left who want to get rid of economic incentive funds they regard as tools of commercial bribery or crony capitalism. It might be interesting to a voter grading the governor’s work in the next election cycle. Perry, relatively speaking, has it easy. He’s no longer an elected official. He doesn’t need the voters’ favor — just that of his boss.